The Vickers Wave eVTOL is the eVTOL version of the Vicker Wave LSA (lightweight sport aircraft). The Wave LSA is an amphibious sport aircraft built to be sleek, safe, and dependable. Similar to to the Wave LSA, The Wave eVTOL design concept is built with ready-to-manufacture components and technology. 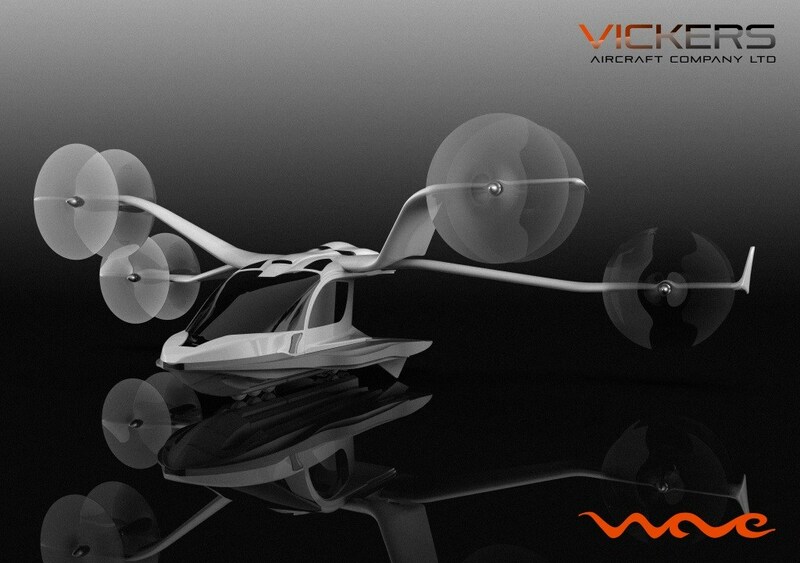 Vicker's Aircraft was founded in 2011, and introduced the Vickers WAVE in 2014. The company is based in Hamilton, New Zealand. Paul Vickers spent several years as a designer and supplier to the aviation industry, as well as a designer of market-leading boats. He eventually decided to begin designing and building his own aircraft, and so founded Vicker's Aircraft. Having already acquired high-level skills in boat building and aviation, Paul decided to devote himself to building amphibious airplanes that he 'would love to fly'. *Note: Vickers Aircraft has not yet built a prototype because it is focusing purely on getting production-ready. It believes having a prototype is "only 15% of the battle"
Company Name: Vickers Aircraft Company Ltd.
Power: Hybrid powertrain gives the WAVE eVTOL the ability to use high powered electric motors for direct drive to the rotors. Capacity: Configurable as a six-person taxi, four seat executive transport, cargo transporter, medical evacuator, and more. Vertical take-off and landing: The Wave eVTOL has Cross-Over landing gear for both water and land. Vertical take off is powered by four wingtip rotors. Fixed wing flight: On two separate wings, each with two rotors. The back wing starts at a lower position, then rises as the rotors rotate into fixed wing flight position. Regulation: The Vickers eVTOL will be piloted rather than autonomous so that it can match regulations more quickly. It is still waiting for changes in the FAA to allow for electric propulsion. Vickers is working closely with the Civil Aviation Authority of New Zealand (CAANZ), which is excited by the prospect of eVTOL Vehicles and is near to becoming the first country in the world to allow manned eVTOL flights. The Wave eVTOL has a high prospect for success. The team seems to understand the difficulties behind bringing a product to market. Their choice to not design a prototype is unique, and may put them at risk of not being noticed. However, their reasoning for doing so is substantial: they see many prototypes that make undeliverable promises. Instead, they hope to focus on manufacturing potential immediately. Because they've based their entire design off already-feasible components, they most likely may be one of the first companies to bring its eVTOL to the production stage. The Wave eVTOL is also unique in its amphibious capabilities–this could position it well in markets that require water landings such as remote islands and difficult to access areas.